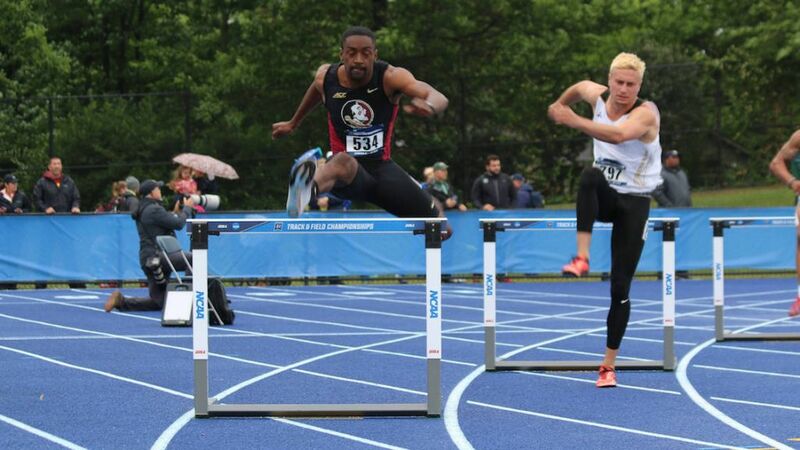 LEXINGTON, Ky. – A cool, damp and dreary day did not deter a pair of Florida State first-time NCAA postseason performers from rising to the occasion in the biggest collegiate meet of their careers to date. Redshirt freshman Veronika Kanuchova and freshman Carlos Becker will finish their seasons at the NCAA Championships, qualifying in the women’s hammer and men’s long jump, respectively, on the first day of. NCAA East Preliminary competition. Kanuchova, whose first season in garnet & gold includes a school record and an ACC title, is headed to Eugene, Ore. and Historic Hayward Field. Delayed nearly three hours as torrential rains pelted the University of Kentucky Track & Field Complex, the Slovakian standout executed the game plan to precision in a competition where, from a field of 48, the top 12 advance after only three throws. Across the track, Becker didn’t waste any time leaving his mark, either. Entering the competition seeded 31st out of 48, the Florida State defensive back stuck an opening attempt of 7.47 meters (24-6.25), which was good for third place with the top 24 seeded jumpers yet to compete. It proved to be good enough for the rising football star, who sealed the Seminoles’ Orange Bowl victory over Michigan with an interception on the final play. Much of the opening day was reserved for first-round competition, which cut the fields in each running event in half. 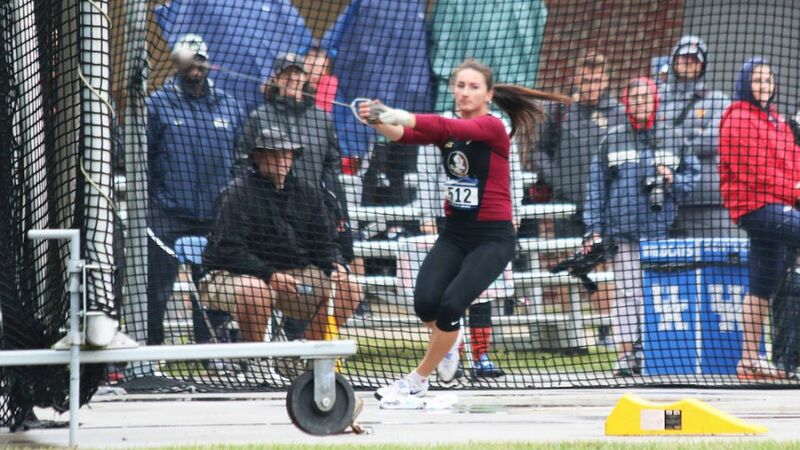 The Seminoles cashed in on five of seven opportunities on the track. Redshirt sophomore Michael Hall drew a tough assignment in the 1500, battling it out in what proved to be the fastest qualifying heat of the day. Perfectly positioned throughout, Hall’s lunge at the finish line sealed a fifth-place finish – and the fifth-fastest time of the day (3:47.84) – to automatically qualify for Saturday’s quarterfinal. Fifth-year senior James Rhoden is headed to the first NCAA quarterfinal race of his career on Saturday, automatically advancing in the 400-meter hurdles with a second-place heat finish in 52.29, after battling a fierce headwind down the backstretch. Shauna Helps kept the Seminoles’ streak of advancing runners alive, moving on to the quarterfinals automatically with a third-place heat finish in 11.43, despite a slow getaway from the blocks. Helps’ quarterfinal 100-meter race is set for 6 p.m. Friday and she will finish her day with the opening round of the 200-meter dash. 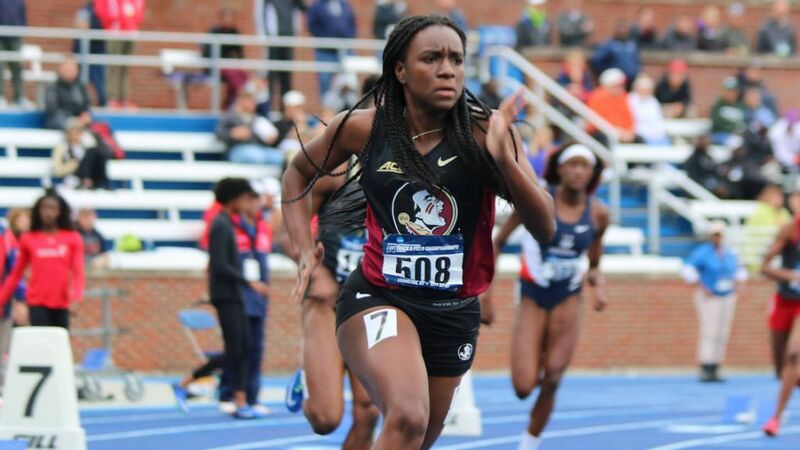 FSU’s final two quarterfinal qualifiers on the day came in the 400 meters; one of which was anticipated, but the other which proved to be one of the biggest surprises of the day. Shaquania Dorsett, seeded 10th overall, battled her way to an auto-qualifying third-place finish by powering up the home stretch. Making her NCAA East Prelims debut, the sophomore registered the 14th-best time of the day, clocking in at 53.40. Freshman Kyle Fearrington followed up his fourth-place ACC finish by advancing to Friday’s quarterfinals on time in 47.53. The opening day of competition was not without heartbreak and disappointment, however. Junior Jogaile Petrokaite, hunting her third consecutive trip to the NCAA Championships in the long jump, finished 13th by virtue of a tie-breaking, second-best attempt. The Lithuanian posted her second-best mark of the outdoor season (6.25 meters/20-6.25), which was matched by Mississippi State’s Leah Lott, who claimed the 12th and final qualifying spot with a four centimeter edge over Petrokaite on her next-best mark. Keniel Grant, a victim of the same tie-breaking procedure at last year’s NCAA East Preliminary, finished 18th and out of the hunt again. The day ended on a sour note when senior Jake Burton was unable to answer the call for start of the 800; the victim of an injury after posting his fastest time of the season at the ACC Championships. Friday’s competition gets underway at 2 p.m. with the highly-anticipated women’s discus, led by 2016 NCAA runner-up Kellion Knibb and her fellow Jamaican teammates Gleneve Grange and Shanice Love. Scott will also send No. 6 seed Austin Droogsma into battle in the shot put, along with senior Chad DaCosta. On the track, the Seminoles’ 100-meter hurdles trio of Peta-Gay Williams, Cortney Jones and Nicole Setterington are set for first-round qualifying races, beginning at 4:30 p.m. Freshman Eleonora Omoregie will also make her NCAA East Prelims debut in the high jump.